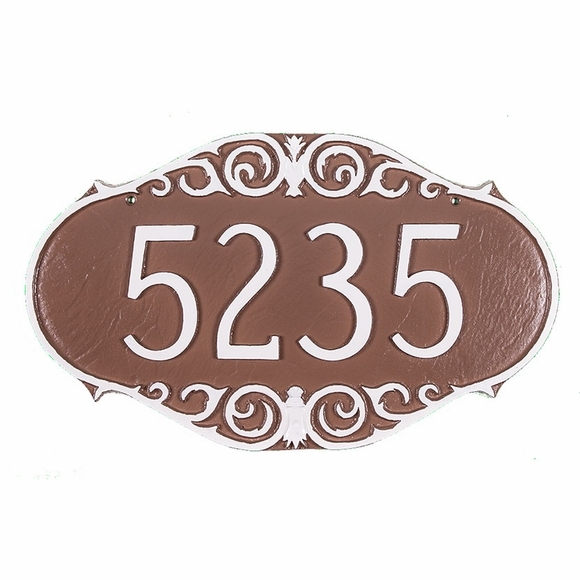 Personalized Victorian Address Plaque - - single line address sign with echoes of Victorian elegance. Made in the USA. Holds up to five 4" numbers or eight 2" numbers. Personalized with your address and the colors you select. Solid cast aluminum construction. Characters, border, and ornate embellishment are part of the sign, not added on. Made in the USA. The Personalized Victorian Address Plaque is beautiful. It's large and the numbers can easily be seen from the street.